Every now and then, I spend some time reading other thinkers and Christian bloggers that make me think, react, or comment. These are some of my favorites this week. I had no clue about Arminianism when I was born again. I had no clue about John Calvin or Martin Luther when the Lord was pleased to save me. All I knew was that Jesus died for my sins, that He rose again, and that He was my Savior and Lord. That was all I knew. Oh friends, don’t worship a theological system. Worship the Son of God! Make Jesus your passion. Don’t exalt a man above the Lord Jesus. Exalt the Lord Jesus and make His name great! Jesus came to ransom us from our sins (Mark 10:45) and His blood can wash away all our sins. 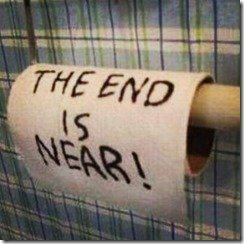 Is Salvation a Matter of Urgency? Miguel Labrador always has me thinking. He a cross cultural missionary serving in South America who asks deep questions out of the work he does. Here is a glimpse from an old post. Delivers a compromised Gospel message. Uses emotional pleas to invoke a response. Relies heavily on methodology and light on being all things to all people. Places guilt on those who are not lead to reach out to specific people in specific times. 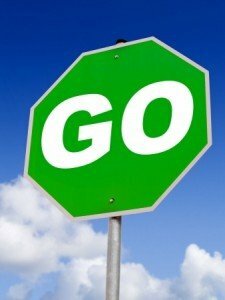 then is there really any urgency in proclaiming the Gospel?. Commitment is a very big word. Especially when it comes to sharing the Gospel. I am challenged by that statement and it made me examine my own commitment levels. Am I blinkered when it comes to sharing the good news? How do I view people that I come into contact with on a daily basis? Do I view them as souls either going to heaven or destined for a lost eternity? What if I don’t think about it and just get on with my day? This is a recurring post I keep returning to. Carey is a great thinking and leader based on what I’ve read so far. ’m going to assume leaders are praying and that the church is biblical and authentic in its mission. I’ll also assume that leaders want to church to grow. But even with all those conditions in place, too many churches just can’t push through. And even once you get past 200, some churches can’t make it past 400 or 800. Again, not for lack of desire or opportunity. So why can’t they grow? They simply haven’t structured for growth. [Read more…] about Does Ezekiel’s calling apply to us today? A driving force behind personal evangelism is a sense of urgency. Without a sense of urgency, evangelism loses one of its core motivations. Without a sense of urgency, the persecutions that believers suffer for the sake of the gospel becomes something to be avoided. The urgency of the gospel has propelled missionaries to all corners of the earth, often at sacrificial cost to their own lives, employment, and family. Are we busy with trivial things? We are busy in our churches with many affairs. We appoint committee members who are focused on administrative issues. We discuss issues ranging from the color of hymnals, women in ecclesiastical office, brand of coffee makers, proper liturgy and what constitutes outreach. 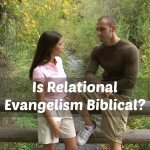 Some committees simply treat evangelism as a hobby, rather than an actual team doing the work of evangelism (not all!). Many of these concerns are legitimate. But we may become so preoccupied with so many diverse interests that we lose sight of God’s main interest – His desire that none should perish. The following Bible verses and themes are often used to justify the urgency of personal evangelism. Jesus is coming back. Jesus, the One who says these things are true, says, “Yes, I am coming soon.” Amen. Come, Lord Jesus!. – Revelation 22:20 (NCV). But cowards, those who refuse to believe, who do evil things, who kill, who sin sexually, who do evil magic, who worship idols, and who tell lies—all these will have a place in the lake of burning sulfur. This is the second death. Revelation 21:8 (NCV). Sin is universal. There is no one who understands. There is no one who looks to God for help – Romans 3:11 (NCV). Christ is the sure remedy for sin. Christ took away the curse the law put on us. He changed places with us and put himself under that curse – Galatians 3.13 (NCV). Is it your fault if people don’t hear? I believe there is one argument in often used in the urgency of evangelism that must be forever removed from our teaching. If someone dies before you share the gospel with them, it’s your fault they are in hell. I’ve heard this expressed in different ways to soften it’s destructive blow. The phrase – It’s your fault -is often hidden or unspoken to soften it’s blow. It’s implied. If you think a person needs 29 conversations with you before getting to the gospel, woe to you if they die before the 28th conversation. You might be the only Christian witness a person might ever see. I think this guilt driven approach to urgency needs to be banned from our teaching. It undermines the sovereignty of God, since you failed God’s ability to save. It undermines the drawing work of God, since it implies that you are the only one ever in the life of that person to witness to the Good News. 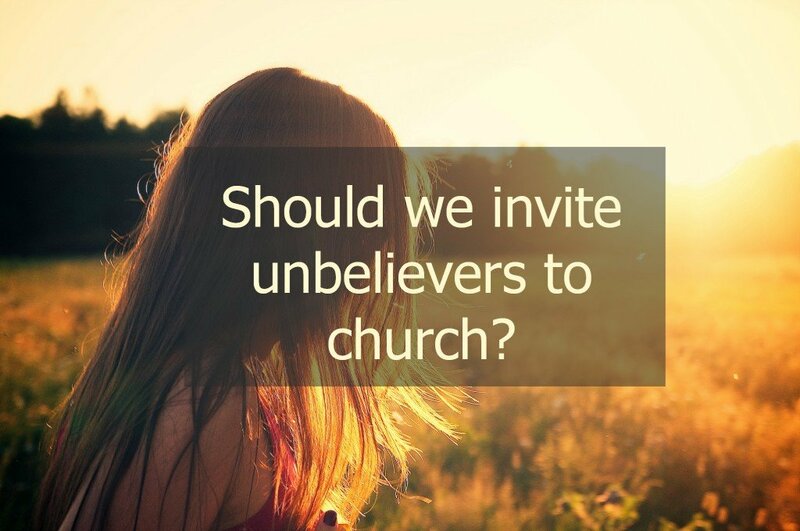 It undermines the witness of the body of Christ, making you to be the only witness when other church members or believing friends could be in their life. It undermines God as the author of salvation, since this makes salvation of someone else dependent upon your obedience. I cannot stand this teaching. I believe it is harmful and guilt inducing. Let’s get rid of the “it’s your fault” teaching when we teach on gospel urgency. 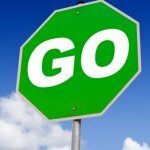 How does urgency affect evangelism? Do I feel that way about family, neighbors, classmates, friends, or even strangers who are headed for a lost eternity? Do I grieve for them? Are there people I desperately want to see come to Christ, or come back to him? Am I willing to lay down my life, and even my resources, so that they might know that there’s hope? It’s a very different emotional motivator than guilt. Now, getting the gospel to as many people as possible is our urgent task. Is it urgent because hell is real? Is it urgent because we know Jesus is coming? Is it urgent because we must warn people about hell? Is it urgent because someone might die and live eternally separated from God because you didn’t share? I’ve been thinking about motives recently. 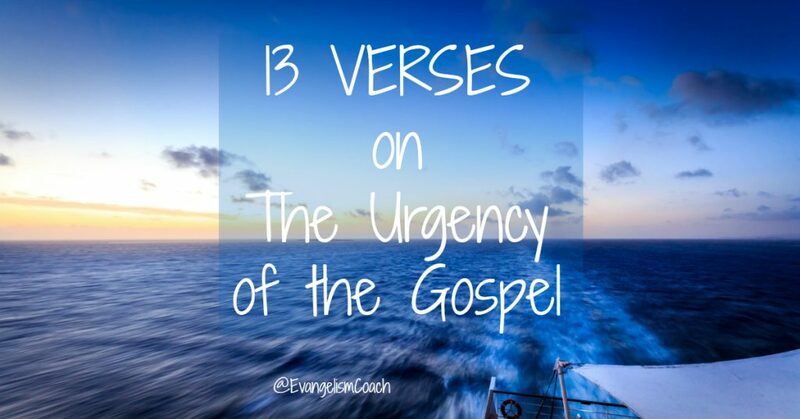 I wonder,how does gospel urgency impact our personal evangelism? 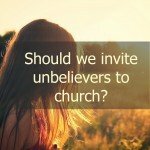 Do we go to the streets with tracts and open air preaching? Do we preach a message of warning to passer-by who don’t hear the solution? 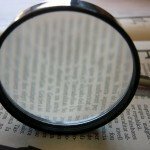 Do we preach about God’s love to passer-by who don’t hear the problem? Do we strive to speak in front of as many crowds as possible, a la Billy Graham or Cash Luna? (Not everyone is a gifted public speaker). Do we make time in our schedule to talk about faith with strangers in the park, 1-1, with a scripted conversation, a la Way of the Master or Evangelism Explosion? Do we find ways to share our faith at work, without being obnoxious, or other relational ways to open up faith sharing conversations? 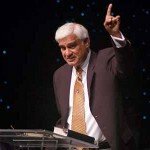 Do we study books on apologetics to provide a rational foundation for our faith sharing discussions, a la Ravi Zacharias? How does one balance the urgency of the gospel with the time it takes to share the gospel in a friendship? How does one balance the urgency of the gospel with the dreaded feeling of guilt that you’ve not done enough?